Our apartment is located in the town centre, less than 100 m away from the Corso Italia bell tower, on Largo delle Poste road, on the fourth floor of a prestigious building. From its windows, you can enjoy a beautiful view of Croda da Lago, with Becco di Mezzodì to the South, Sorapis to the East, and Tofane on the West side. It is 2 min away from shops and exclusive sites, and 200 m away from the Faloria Cristallo Ski area. The flat can accommodate up to 6 people. The living room has a dining area, a cabinet, smart TV LG HD 50" (new 2018), adsl Wi-Fi, armchair, and sofa. Bedrooms (3): balcony access, a twin bedroom, a further twin bedroom, and a private bathroom (with shower). All bedrooms have wardrobes. There are two well-equipped bathrooms, with accessories, bathtub, or shower. The balcony can be accessed from the living room and the double bedroom. The flat offers furniture, crockery, a dishwasher, ornaments, and washing machine. The apartment also has a wine cellar and a utility room on the ground floor, useful for storing your ski equipment. The rent includes consuption, final cleaning (90€) and linen ( linen is free for 2 people and 4€ per day for each additional person). A 50 % deposit is requested upon booking. My husband and I are retired. He was a professional: an engineer, designer, and builder of recreational boats. I was a French teacher. We have two grown-up children who are marine engineers. We currently live in Bergamo and have become grandparents. The house is only 200 m away from the cable car that goes to the Faloria Cristallo ski slopes and 150 m from the shuttle bus station that goes to Tofane. 50 m from the pedestrian area of Corso Italia and 100 m away from the famous 'Cooperativa,' a large shop that offers everything you need! With three bedrooms and two bathrooms, this apartment is most comfortable and well-located in the heart of Cortina d'Ampezzo. Great kitchen with dishwasher and microwave, plus espresso maker and coffee hot pot. Would be a great place for skiers or hikers in the Cortina area. Only shortcoming is parking which is not immediately available but can be found for a fee nearby. Perfect get away! 2hr drive or bus from Venice. Great place steps from town center, restaurants, and bus station. Prompt and responsive host. The good: location. 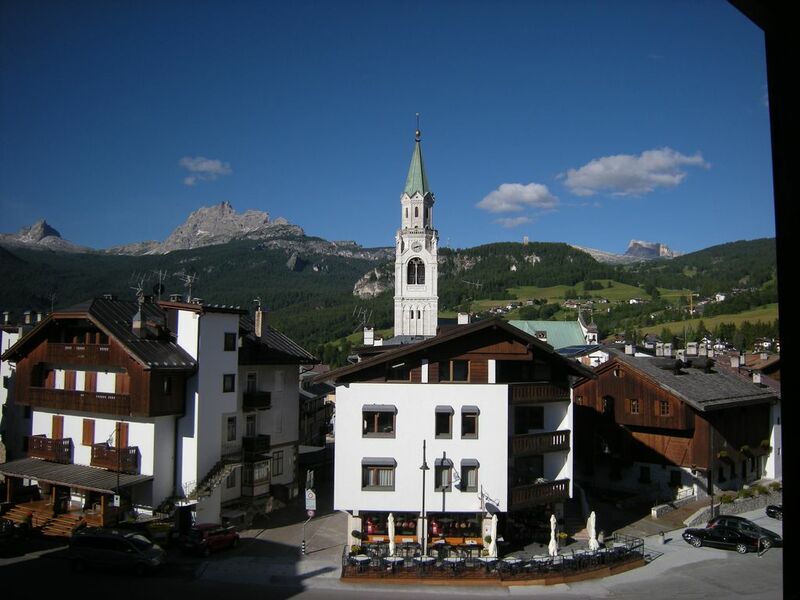 It is a very short walk to central Cortina so you are close to bars, restaurants and shopping without having a high footfall past your property. Views from (small) balcony are fabulous, it's a shame you can't eat outside. We arrived late at night and so picked up the keys from a local hotel, this was made very easy by Bruna. There are 3 free car parks on the outskirts of Cortina which we used without any hassle. Loads of fantastic walks are a short drive away, perfect summer walking. The bad: Second bathroom shower leaks. Price does not include extras (electricity, gas, water, cleaning and linen all added up to an amount we were not expecting). The main bedroom looks out onto the square so on fri and sat night there is some noise from the bar and the bodega opposite (but not all night). Appartamento molto confortevole e perfettamente accessoriato e riscaldato. La proprietaria è stata disponibile e cordiale. Si trova in pieno centro, comodissimo ai parcheggi ed a tutti i servizi. A pochi passi dagli impianti. Ideale per famiglie anche con bimbi piccoli. Ci ritorneremo di sicuro! I signori Bagnoli son stati collaborativi e disponibili.Li ringrazio per la loro correttezza e positività. Per noi sarebbe un piacere averli ospiti ancora. Tolle grosszügige Ferienwohnung mitten in der Stadt! Wir waren als Familie (2/2 plus Hund) für eine Woche in der sehr zentral gelegenen FeWo und können diese uneingeschränkt empfehlen! Sauber, sehr geräumig, vollständig eingerichtet, zuverlässiger guter Kontakt zur Vermieterin. Kleine Nachteile: kostenloser Parkplatz 5min Fussweg entfernt, langsames WLAN, 4. Stock (Fahrstuhl), städtisch üblicher Lärm. The landlords were very friendly and helpful, and the appartment has a vintage charm and is spacious, well equipped with care, and has a good view. From Venice (155 km away), go to Belluno along the A27 motorway until the end of the road (Ponte nelle Alpi). Continue onto the SS51 state motorway (60 km) to the town centre. Cortina d'Ampezzo, one of the most popular locations in the world, is located in a green valley surrounded by the famous peaks of the Belluno Dolomites National Park. The walk along the Corso Italia, well known for the elegance and exclusivity of its shops, starts from the Church and its famous bell tower. The following characteristics, as well as those above, make Cortina is the ideal location for a beautiful and exclusive holiday. In winter its beautiful and famous ski slopes, in summer excursions, sometimes a bit challenging, in a unique setting.